Long Painting Company was recently awarded a construction contract from Energy Northwest, a consortium of 27 public utility districts and municipalities which operates four electricity generating facilities: White Bluffs Solar Station, Packwood Lake Hydroelectric Project, Nine Canyon Wind Project and Columbia Generating Station (a nuclear energy facility). The project—repainting The MET tower—a 240’ guyed tower used for meteorological measurements, took place at the heavily guarded Columbia Generating Station. 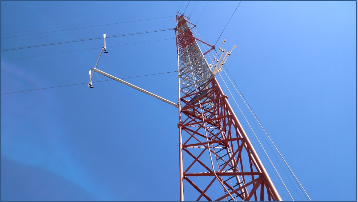 Requiring careful prep, containment, and painting of the 240’ tower, Long Painting Company was able to complete the job in 39 days, concluding the contract on Oct 28th, 2016. The job consisted of removing existing loose lead based coating via hand tool and solvent, and over coating all paint with water based acrylic coating (2 coats). Because of the lead paint factor, all debris had to be contained, which made for an unique contain, prep, and paint scenario. Crews determined that containment sections would be safely broken into 34 foot segments, of which there were seven. Crews prepped section by section, which allowed for a follow up, painting, and most importantly containment of lead based paint to avoid soil contamination. 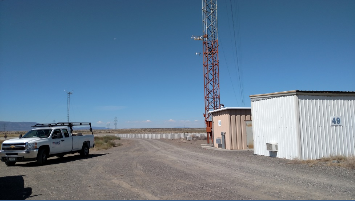 Our team was careful to follow all safety and security policies, and was required to paint the tower in accordance with FAA regulations (aviation orange and aviation white were used). We focused on doing the job quickly and efficiently, and successfully avoided contamination of the area. In addition, we kept a close eye on conditions to ensure the safety of the project. This included regular job hazard analysis, a fall protection plan, and monitoring the crew for heat stress illness. The job went according to schedule and there were no incidents. As always, we at Long Painting take pride in our impeccable safety record, our transparency, and our ability to follow safety guidelines and protocols set out not only by our industry, but also those requested by our clients. Special recognition goes out to Bruce Budworth for leading the team on site.